Congratulations to Stephan on his KDE-related job. My condolences to Jess and Ian. Take care! Cool dude and FOSDEM organizer Loki has become a father. Congrats on your little daughter Pascal. See you at the next FOSDEM event in 2006! I apologize to Robert Stoffers for not sending his book prize which he won in the KDE Docs Competition last year. I forgot about the whole thing because I was consumed with other non-KDE stuff. But this is no excuse. Robert your book is on its way to Australia and I owe you a drink. Boudewijn mailed me about a Krita hackfest which is taking place soon in the Netherlands (we keep you posted). It would be a cool and fun idea to have some shirts the hackers could wear during this hackfest. So I contacted the KDE-Artists on IRC (#kde-artists). 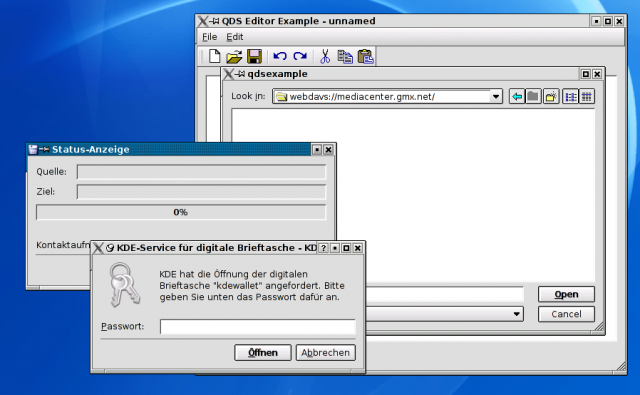 Beineri talks in his latest blog entry about some applications we are missing in KDE. Please check KDE-apps-org where you can find a blog client called PyQLogger. Read more about Missing Applications!? Tommorow we are having a BBQ with people of KDE-NL. We did this before and we agreed to have a bbq each year during summer. Rinse is our host this year. As he is a cook, I have high expectations of this year's bbq. Artists of the world ... unite!! Read more about Artists of the world ... unite!! Canllaith recently started a new series on the Dot called This Month in SVN. This is indeed a cool idea to give non-technical people some insight on what is happening in SVN. Bram is also impressed with these series. As we are having a KDE bbq soon, I promise to bring these goodies with me. The last 5 months I completed a traineeship for which I now need to write a report. Last 2/3 weeks I have been very busy with this report as I am planning to graduate of course :o). So no IRC, no e-mail, nada! Today I tried to read up on some mails. But I suggest that you resend your mail in case you urgently want to speak to me. Read more about Still here!